This is the largest ray in the world, its ‘wing span’ averaging about 22 feet across, but measured at almost 30 feet in rare cases. It has distinct triangular pectoral wings that arch backwards, and cephalic fins on either side of its mouth that can be unfurled and angled to direct water and plankton into its mouth. They are classically dark on top and white underneath, but often have light marks on top and dark spots underneath that are unique to each ray. They ‘flap’ their fins to fly through the water, usually in groups, and can jump completely out of the water when playing or impressing a potential mate. Manta ray, Atlantic manta, Australian devilray, blanketfish, devil ray, devilfish, devil-ray, eagle ray, giant devil ray, giant manta, giant Atlantic manta, great devilfish, manta, manta ray, Pacific manta, prince alfreds ray, sea devil, and skeete are common names in English language. Other names include diable de mer (French), duivelsrog (Dutch), jamanta (Portuguese), manta (Italian), manta atlantica (Spanish), oni-itomaki-ei (Japanese), raya (Spanish), teufelsrochen (German), and urjamanta (Portuguese). M. birostris has been harvested in tropical America. The manta ray was formerly harvested commercially off Australia and California waters for its liver oil and for its skin which is used as an abrasive. Today it is rarely hunted, although meat from the manta ray is considered a delicacy in the Philippines. Dive tourism has benefited greatly from the manta in locations where they are reliably encountered and sometimes approach divers. In these areas, where divers often touch and interact with mantas, the rays can develop skin lesions in response to the removal of the protective mucous layer. 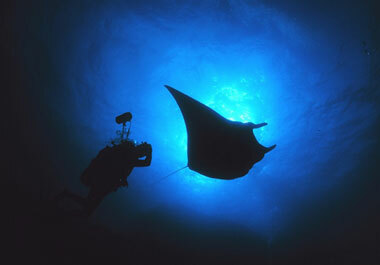 Mantas are of minimal danger to humans. 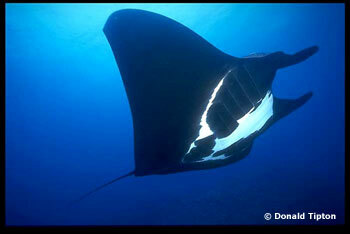 > Check the status of the manta ray at the IUCN website. The manta inhabits temperate, tropical, and subtropical waters worldwide, between 35° N and 35° S latitudes. In the western Atlantic Ocean, this includes South Carolina (US) south to Brazil and Bermuda. Occasionally this ray is observed as far north as New Jersey and San Diego. 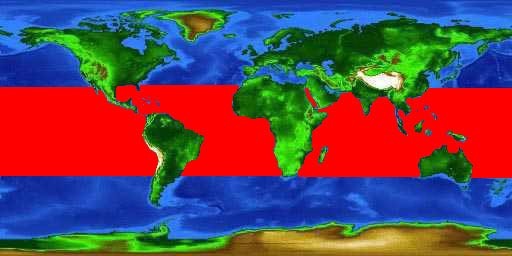 Other locations include the east coast of Africa, in the Gulf of Aden, Red Sea, Arabian Sea, the Bay of Bengal, as well as the Indo-Pacific. Habitat of M. birostris ranges from near shore to pelagic, occurring over the continental shelf near reef habitats and offshore islands. It swims by flapping its large pectoral fins, and is usually observed near the surface or in the mid-waters of reefs and lagoons. It sometimes migrates into temperate waters. M. birostris sometimes swim in loose aggregations and spends considerable time near the surface. Mantas have been observed breaching, jumping clear of the water and returning with a splash. Three types of jumps have been observed, forward jumps landing head first, forward jumps landing tail first, and somersaulting. Groups of these animals have been seen participating in this behavior, breaching one after the other. While it is not understood why this behavior is exhibited, some speculate it may play a role in attracting mates or is a form of play. Adults are easily recognized by their large triangular pectoral fins and projecting cephalic fins, forward extensions of the pectoral fins that project anteriorly on either side of the head. Each cephalic fin is about twice as long as its base is wide. The length of each cephalic lobe, from tip to the mouth, is 14% of the disc width. They are rolled like spirals when swimming and flattened when eating. This ray has smooth skin, a broad, rectangular terminal mouth located at the front of the head, and a tail that lacks a spine. Unlike other mobulids, the mouth of the manta is in the terminal location, not inferior. The spiracles and the eyes are located laterally, while the gills are located ventrally. The disc is 2.2 times wider than it is long, not including the cephalic lobes. The tail from cloaca to tip is as long as the cloaca to the front of head. The tail is slightly flattened and is shorter than disc width. The head is slightly concave between the cephalic lobes, thereby forming a shallow triangular cavity anteriorly. The head region also forms a crest from nape to should but is otherwise flat. M. birostris has a dorsal fin that is located just anterior of the pectoral axis. The height of the dorsal fin is 83% of its base length. The base of the dorsal fins is 34% as long as the mouth is wide. Individual mantas possess distinct dorsal and ventral coloration that is unique to each animal. Generally, it is dark brown, grayish blue, or black on top with pale edges and white underneath. 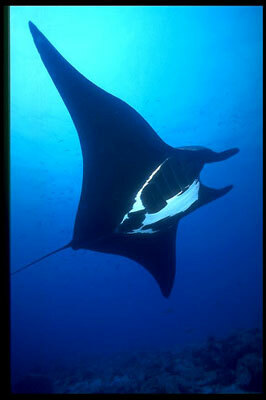 Some individual mantas have pale patches and color patterns on top as well as dark blotches underneath. These color variations have been used to identify individuals. M. birostris possess teeth only on the lower jaw. There are 18 rows of teeth on the center of the lower jaw, with row number decreasing to 12-14 toward the corners of the mouth. Conical and ridge-like tubercles are present and sporadically placed over the disc, pelvic, and tail regions on both the dorsal and ventral surfaces of the disc. Tubercles of the ventral surface are radially striated. This ray can achieve a maximum disc width of 29.5 feet (9 m), with an average width of about 22 feet (6.7m). 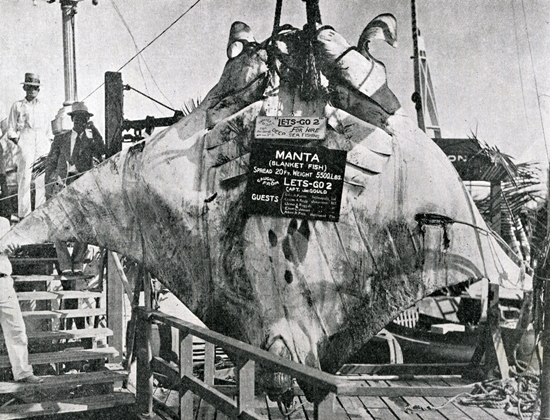 The largest specimens of the manta weigh up to 3,000 pounds (1350 kg). Estimated life span for these giants is approximately 20 years. All mobulids are primarily filter feeders that occasionally consume small fish. The filtering mechanism consists of plates of pinkish-brown sponge-like tissue located between the successive gill bars that support the gills. When feeding, the cephalic lobs unfurl, directing plankton-rich water towards the mouth. Many have opportunistic remoras attached to their undersides, consuming scraps that result from feeding. Mantas have been observed swimming in slow vertical loops within rich feeding areas. They aggregate in areas that offer large concentrations of zooplankton, with up to 50 individuals within an area. Oceanic islands and submarine ridges provide precious few sites containing nutrient-rich waters and an abundance of zooplankton, in the otherwise nutrient poor tropical regions. Males reach maturity at a disc width of at least 13 feet (4 meters) while females mature at a disc width of 16.5 feet (5 meters). During copulation male rays bite the pectoral fins of the females before aligning themselves, abdomen to abdomen, inserting one clasper into the female’s cloaca. Manta rays reproduce by ovoviviparity with the birth of one pup during a breeding season. Embryos have been shown to reach 50 inches in disc width and weigh 20 lbs. or more. Parturition occurs in relatively shallow water where the young remain for a few years prior to expanding their range offshore. Due to their size, the only predators of the manta ray are large sharks. Specific parasites associated with M. birostris are unknown. However, this ray is known to visit wrasse cleaning stations on a daily basis. 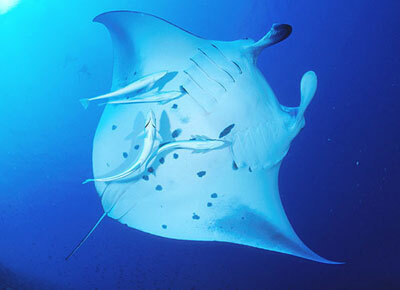 These fish function to remove parasites from the mantas. Manta birostris was first described by Dondorff in 1798. Synonyms include Cephalopterus vampyrus Mitchill 1824, Cephalopterus manta Bancroft 1829, Manta americana Bancroft 1829, Ceratoptera johnii Müller & Henle 1841, Ceratoptera alfredi Krefft 1868, Brachioptilon hamiltoni Hamilton & Newman 1849, Raja manatia Bloch & Schneider 1801, Manta hamiltoni Hamilton & Newman 1849, and Manta alfredi Krefft 1868.